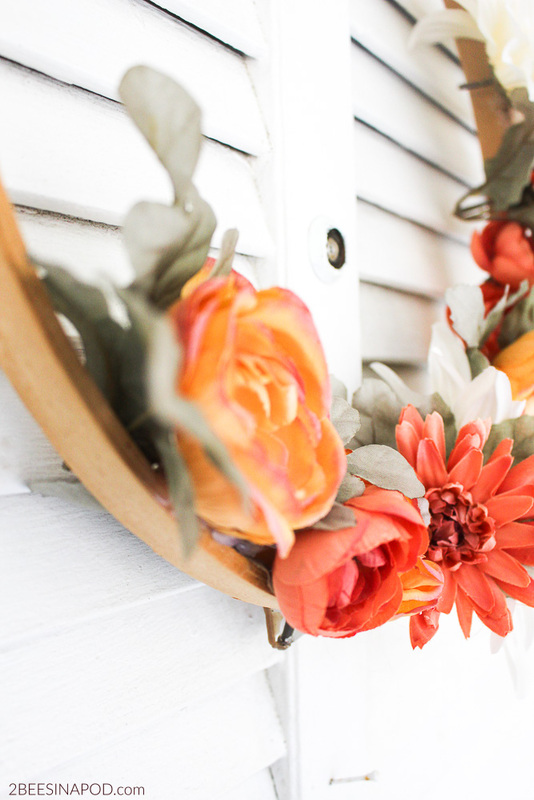 Y’all, I am so excited to share with you this simple DIY Fall embroidery hoop wreath. It took me about 15 minutes to make and I am obsessed with how it turned out. As I mentioned last week, my brain is in full on Fall mode. I am already gearing up for the season by doing some easy DIY crafts. You can never be too ahead of the season, right? This post contains affiliate links. 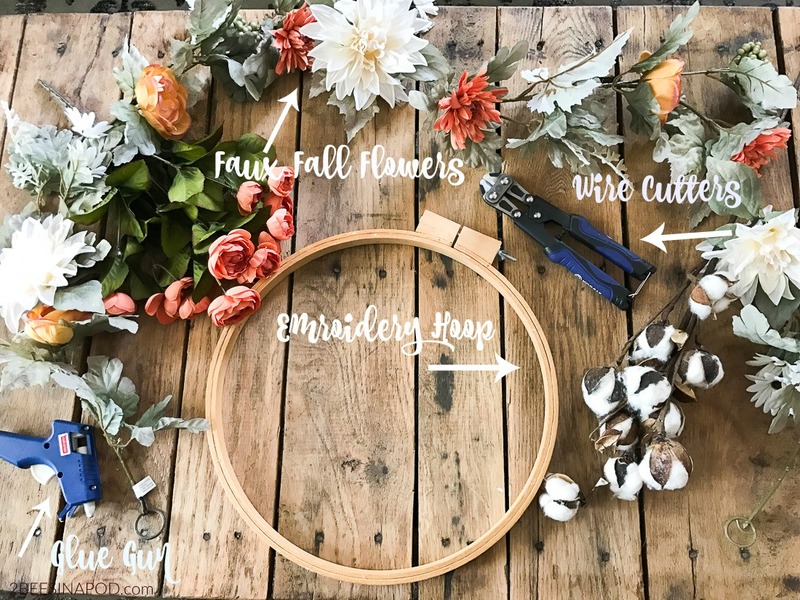 Here is what you’ll need to create your own Fall embroidery hoop wreath. I used a string of garland instead of getting several bunches of flowers. This way I could also use the greenery in the garland. I did go ahead and get one bunch of smaller flowers to use as filler. And the best part is that I have a lot left over so I can make another Fall wreath. The first thing I did was use the wire cutters to cut off the flowers I wanted to use. Then using the glue gun, I placed the flowers where I wanted them to go. After that, all I had to do was hang the wreath on the front door. It was as easy as that. You can see how simple it is to make your own in this quick video I put together. 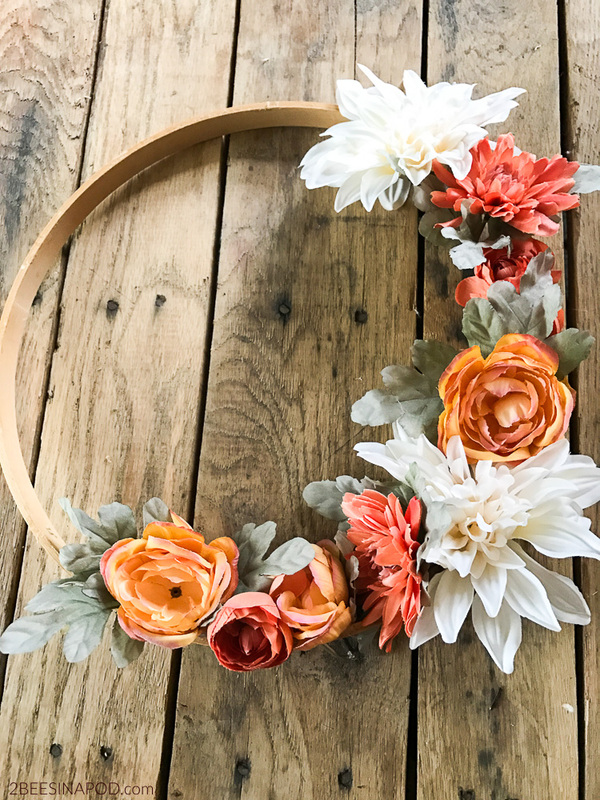 Creating this Fall embroidery hoop wreath was so much fun! Isn’t it just the cutest?! Now I know I’m a little biased since I made it, but I love it! It looks great against my white door and adds a little pop of color to the front. Definitely not a traditional Fall wreath, but I am loving the hues of orange I found. Totally in love with these colors, right? Really I’m not lying when I say it took me about 15 minutes to make the wreath. It is one of the easiest craft projects I’ve ever done. And it looks awesome on my front door. I’m slowly incorporating Fall onto the porch and not rolling it all out at once. Can’t look like the crazy lady on the block! 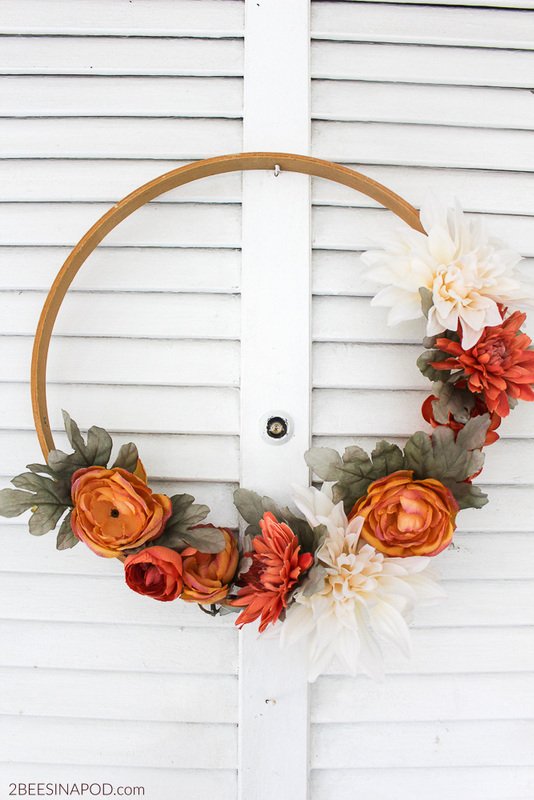 Let us know if you try to make your own Fall embroidery hoop wreath. We’d love to see it! Very pretty! The colors are perfect! I made something similar for my bedroom. It is part of a bedroom reveal so I will post it soon. 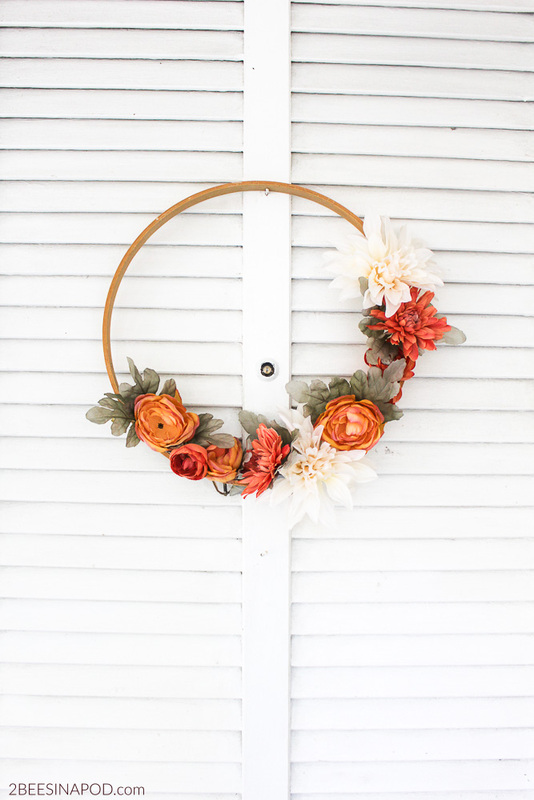 I loved the idea of the hoop as the wreath’s frame…it made it feel extra crafty! Lol! This is the cutest hoop wreath ever! You have wonderful ideas! Love it so much! LOVE the flowers used in this! 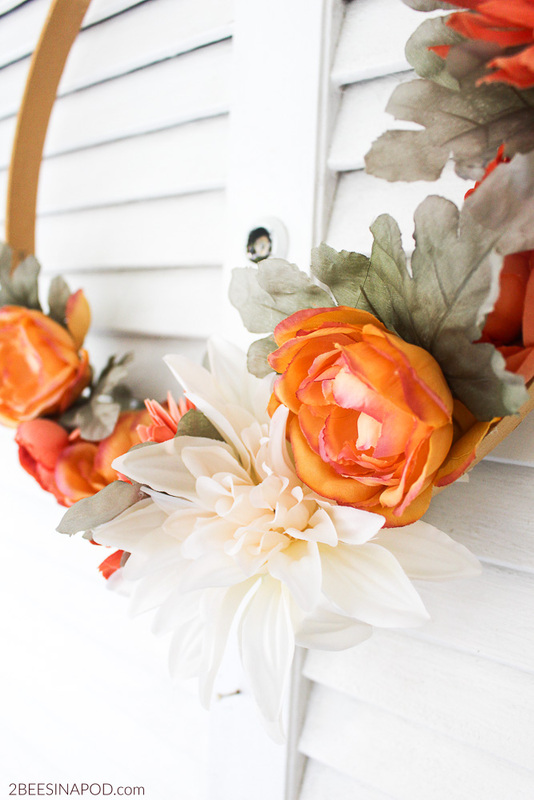 Wanting to make one this weekend, where did you get this particular garland to cut the flowers from? Really looks gorgeous for fall!